Lich is probably one of the coolest cards from Alpha that didn’t get reprinted after Unlimited. When you look at the card you can almost see how evil the card is, with the foul Lich in the art and a four black mana casting cost. So it’s not strange that a lot of people wants to play with the card. Read here about what you can do with it. The foundation of this deck looks a lot like Deadguy Ale but instead of using white for efficient and versatile removal it goes full aggro with cards like Lightning Bolt and Chain Lightning. As with Deadguy Ale the creature base is made up by the usual black suspects, meaning Black Knight, Hypnotic Specter and Juzam Djinn. The combination of black and red also gives this deck access to the powerful Sedge Troll. As with most other Juzam decks, those with a tight budget can use Su-Chi instead of Juzam Djinn, or you can choose to build the deck lower to the ground by skipping the 4-drops altogether and instead playing cheaper creatures. 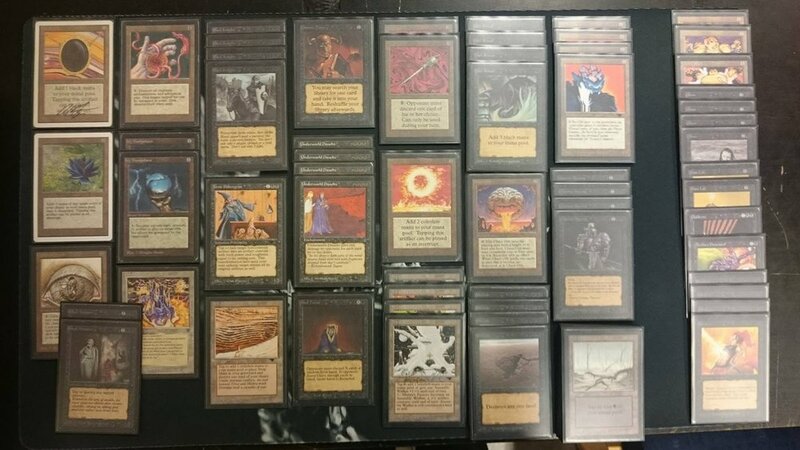 Reanimating fatties is a strategy as old as the game itself; and if something is as old as the game itself of course you can build a deck based on it in 93/94. The game plan is the same as with any other reanimation deck in any other format, you just use different cards. That means that you first of all need a discard outlet to put a creature in your graveyard. Then you also need some cards that let you put creatures from your graveyard onto the battlefield. The cards that you have at your disposal for the second part of the combo are Animate Dead, Resurrection, All Hallows Eve and to a lesser extent Hell’s Caretaker and Reincarnation. To bin your fatties, you can use cards like Jalum Tome, Bazaar of Baghdad and Mind Bomb. Just mix and match as you see fit to make up you deck. When it comes to the big monsters there are some problems as most of the big creatures in this format have horrible downsides. But some examples of creatures that you can use are Nicol Bolas, Chromium and Shivan Dragon. Another reanimation target is the humongous Colossus of Sardia, but then you also need a plan for how to untap it. A couple of cool and interesting ideas that have been used in the past is getting another one with Transmute Artifact or sacrificing the monster with the card Sacrifice to end the opponent with a big Fireball, or to cast another Colossus of Sardia. This deck is all about resolving an Underworld Dreams and then letting your opponent draw themselves to death. Of course that would take some time if you don't help them on their way, therefore you play cards like Wheel of Fortune, Winds of Change and sometimes also Howling Mine. If you want, you can also pair the Howling Mine with Relic Barrier. The deck usually complements the main plan with a bunch of Lightning Bolts which can be used both as creature removal or for extra reach so that you can finish of the opponent after Underworld Dreams has done its thing. Sometimes this decks contain a couple of creatures for another angle of attack but it can also be built completely without creatures so you can play a couple of The Abyss. This deck revolves around the card Nether Void and as with many other decks on this site The Void can be built in many different ways. Nether Void itself is a extremely powerful enchantment from Legends that makes everyone pay an extra three generic mana for all of his or her spells. This usually stops the opponent from playing spells and if you don't play spells you usually lose. Of course the enchantment also affects you but as you know it's coming you can build your deck around it. One way is to combine Nether Void with a lot of land destruction, making the deck play a lot like Ponza but later locking the opponent out of the game completely by dropping a Nether Void. Another way to build it is with cards like Dark Ritual and Mana Vault to power out the Nether Void even before the Opponent has three mana. Mana Vault is also quite good after the Nether Void has hit the table as you can untap it every other turn and cast expensive spells the other turns. You can also choose to not play that many expensive spells so you can function even with the Nether Void in play. As with most prison style decks the deck run few wincons and one of the best is of course Mishra’s Factory as it doesn't cost any mana. The Abyss is one of the most powerful cards from Legends and it is the bane of most creature decks in the format. But here's the thing, The Abyss has a small "loop hole" and that is what this deck is built around. Usually you only put The Abyss in a deck completely without creatures, but this deck does the exact opposite and plays a whole bunch of creatures. The Abyss’ ”loop hole” is that it actually doesn't kill all creatures, instead it leaves artifact creatures alone. Therefore, this deck plays 2 - 4 The Abyss to kill all of the opponent's creatures, and then it utilizes Su-Chi, Juggernaut and other artifact creatures that don’t care about The Abyss to smash the opponent's face. That is the foundation of this deck and what other cards to fill the deck whit is completely up to you. A couple of examples are Sinkholes, Underworld Dreams, blue splash for power or maybe a red splash for Lightning Bolts and other burn spell. A deck that is more evil than this is hard to get. If you meet a player that has been playing since the early days, chances are the mono black deck is the deck they have the most vivid memory of. This deck plays all of the good black creatures paired with format power house Underworld Dreams to attack the enemy on two angles. One card the mono black player seldom leave home without is the black boon, Dark Ritual, a card which allows for classic plays like a turn one Hypnotic Specter or turn two Juzam Djinn. Budget versions of this deck usually trades the crazy expensive Juzams for Su-Chi which also allows them to play City in a Bottle in the sideboard. Another card worth mentioning is Sinkhole, a card that sometimes can win games by itself.